Since I am a fan of the Pern books by Anne McCaffrey, and I enjoyed reading Dragon’s Kin, a book by both Anne McCaffrey and her son Todd McCaffrey, some might feel that any praise I have for Dragonsblood is from loyalty to a fictional world that I have loved since I was a teenager. A fan might be considered a fanatic, and a fanatic is a person marked or motivated by an extreme, unreasoning enthusiasm for the object of their fanaticism. A fanatic is usually unwilling to have the object of their fanaticism messed with, or changed. I am an emotional type of person, but I am not unreasoning in my review of Dragonsblood. Dragonsblood is a complete story that gives you the information you need to understand what is going on, without spoon-feeding you the history of Pern in a prologue. If you are a fan, or maybe a fanatic, of the Pern series, you will find Todd McCaffrey to be more than a Journeyman Harper, and well on the way to being a Masterhaper. I will give you a not very precise history of Pern. Humans came to Pern to colonise. Everything didn’t go as planned. A rogue planet, in the Pern system, every two hundred years or so, comes close enough to Pern to drop thread, an organism that eats up living matter. The colonists genetically engineer dragons, from the indigenous fire lizards, to help them fight thread. Dragonsblood tells the story of Lorana, a girl with a talent for healing and understanding dragons, who is a pivotal character in dealing with an epidemic that could possibly wipe out dragons just a few hundred years after they were created. This story made me laugh and made me cry, but most of all it made me think. 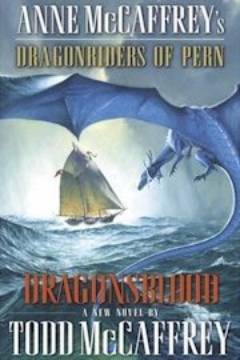 Dragonsblood is a worthy addition to the Pern series. I look forward to more books by Todd McCaffrey.